Sunday December 11 2016 2pm-8pm. All are welcome to attend. Kindly fill the regular weekly rsvp form / contribution prepayment below . 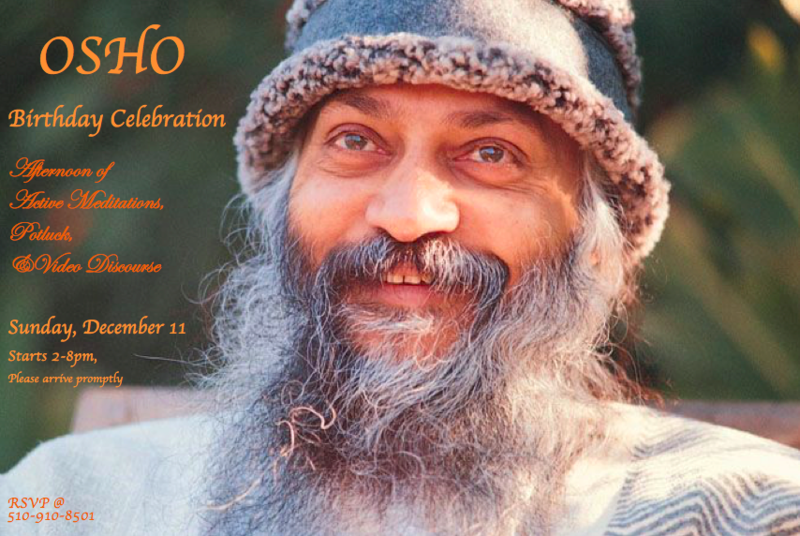 Special Note for contribution towards Dinner and Cake for Osho : $20 per person is recommended to be paid towards dinner and cake for Osho by paypal here https://goo.gl/cl9XQV. Again this is only a suggestion. Contribution towards Meditation Space : Contributions are how we maintain the meditation space. The suggested amount is $20, but no one will be turned away or noticed for lack of funds, because we also know what a valuable, priceless, precious, wonderful gift meditation is in a person's life.